Civil AccuDraw is the civil-specific version of MicroStation AccuDraw. Both are intuitive, precision drafting tools. 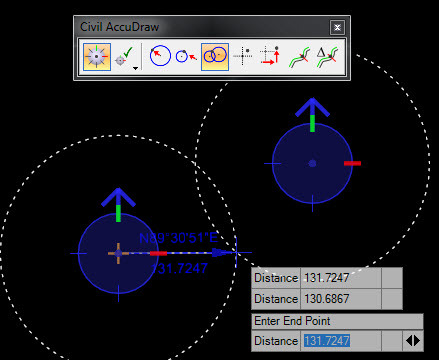 Civil AccuDraw goes beyond MicroStation AccuDraw by supporting civil-specific drafting functions, including stations and offsets, bearings and distances, elevations, and more. – Input a coordinate by distance and direction from a single origin point. – Input a coordinate by distance from one origin point and direction from a second origin point. – Input a coordinate by distance from one origin point and distance from a second origin point. – Input an absolute coordinate by direct (X-Y-Z) entry. – Input a coordinate by relative (dX-dY-Z) location from a single origin point. – Input a coordinate by station and offset. – Input a coordinate by relative station and offset. 2. Civil AccuDraw is flexible. Not enough coordinate entry options? Or too many? 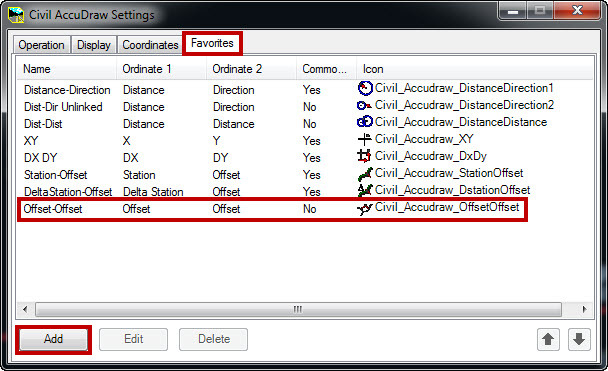 The Civil AccuDraw Settings allow you to add, edit, or delete coordinate entry functions. To manage these settings, open the Civil AccuDraw Settings and go to the Favorites tab. 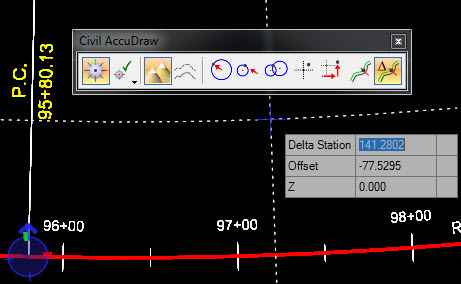 Here I created an Offset-Offset function and it now appears on the Civil AccuDraw toolbar. 3. Civil AccuDraw is easy to use. 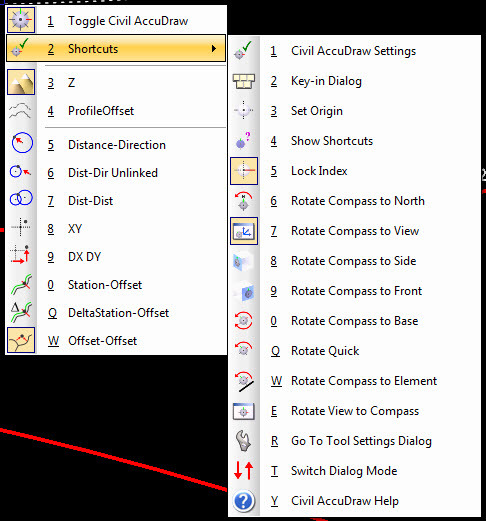 Whether using the tool bar, fly-out menu, or key-ins, Civil AccuDraw commands are intuitive and easy to use, allowing for less time creating construction geometry.